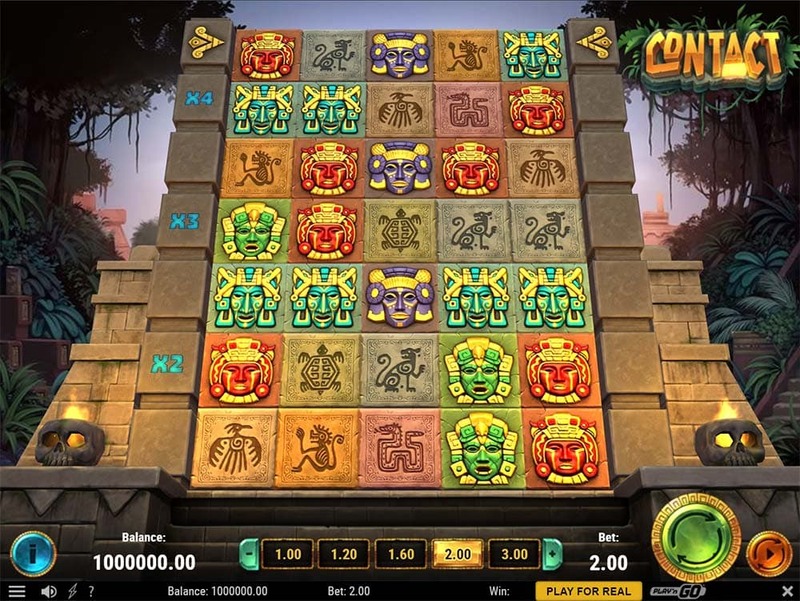 We Explore What Treasures Lurk in Contact the Latest Innovative Grid Slot From Play’n GO! There’s a couple of great reasons to check out Vera and John Casino this week, firstly they are celebrating their 8-year anniversary with a whole load of great promotions and special offers up for grabs in the V+J loyalty store, and they have just added the latest Grid slot from Play’n GO titled Contact to their casino, and this is a slot we really enjoyed playtesting! 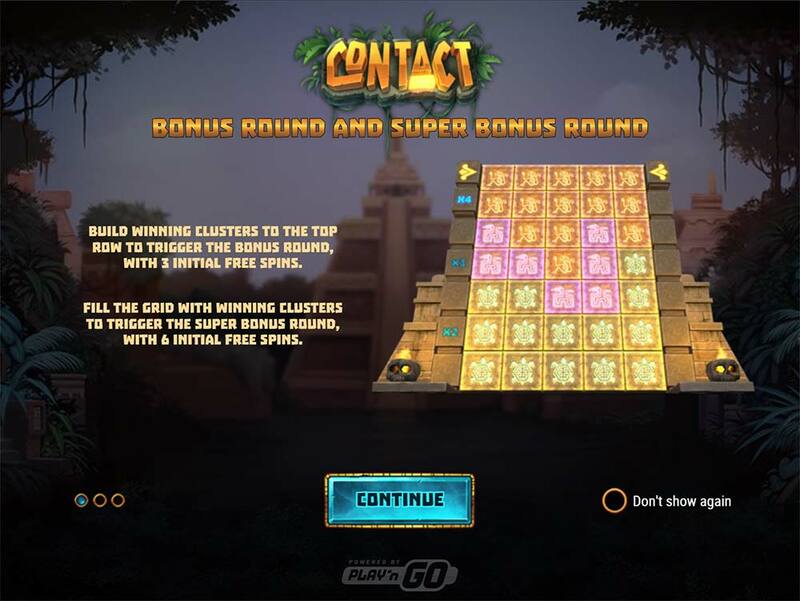 Contact is a 5×7 Grid styled with an ancient Mayan culture theme that uses a cascading or tumbling reels style setup with the symbols dropping vertically, similar visually in style to Gonzo’s Quest (NetEnt) but with a whole host of new and interesting mechanics along and with 2 different free spins bonus rounds to check out. 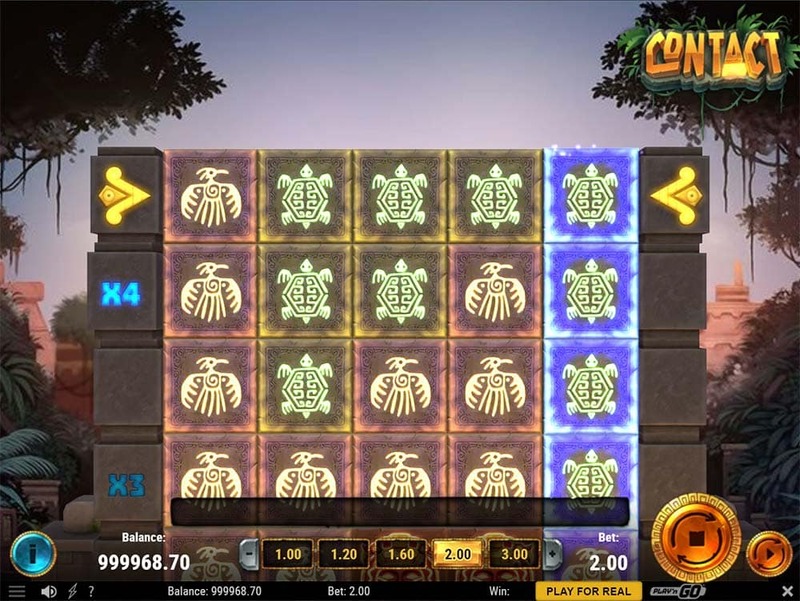 There are no regular paylines at play here, instead, you are looking for clusters of matching symbols to trigger a win, when this happens all the winning combinations are held stay on the screen falling to the lower levels of the slot with new symbols added from the top. There are a couple of multiplier values on the left side which activate when these areas are fully filled with matching symbols and to trigger the main bonus rounds you need to reach the very top of the grid with winning symbols. 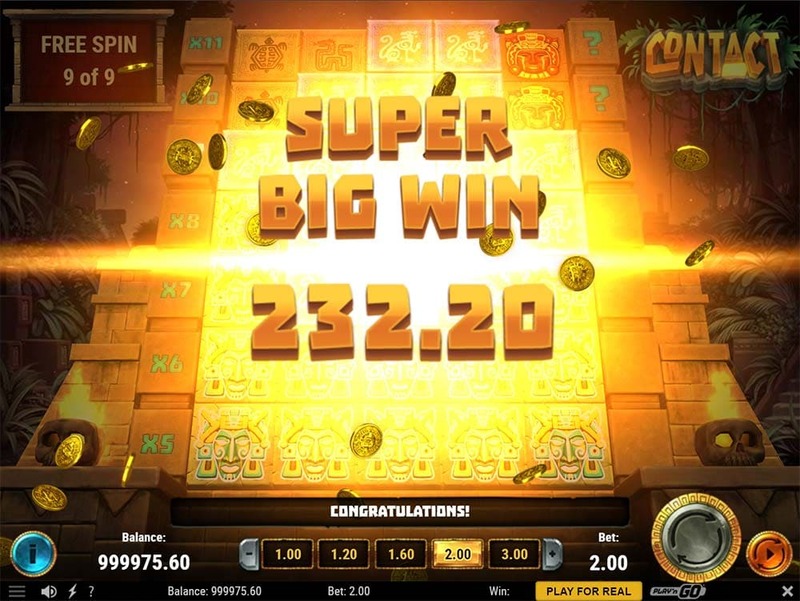 There are actually 2 free spins modes on offer here, reach the top of the slot with clusters of wins and you get the regular bonus round (3 spins), but fill up the grid completely and you’ll be awarded the Super Bonus Round (6 spins) where things really do heat up. 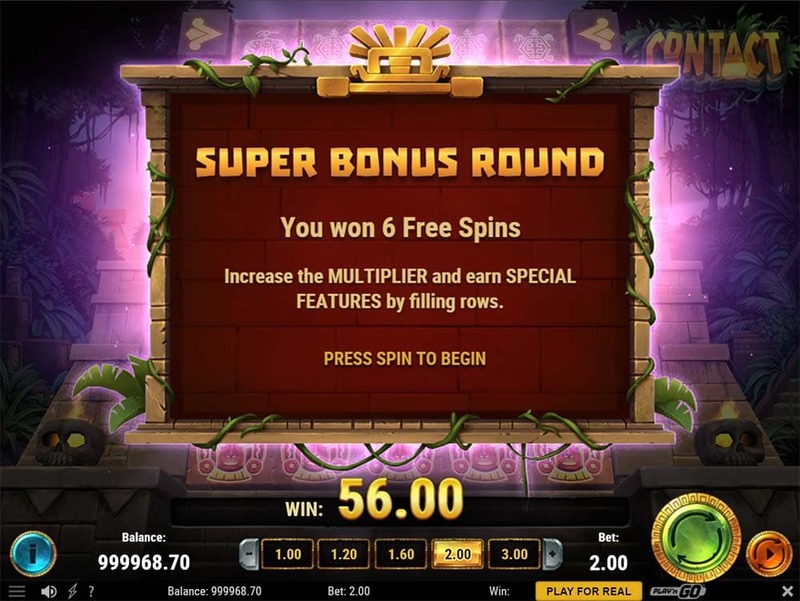 During the bonus rounds, there are a number of extra features that can be activated by filling up the grid, whilst there are already more multipliers at play on the left side you can look forward to special features such as Block Destroyer, Symbol Upgrades and Extra Free Spins. It’s also worth noting that all of these special features are much more potent in the Super Bonus Round giving you a much better chance of some of those Super Big Wins. During the bonus rounds, the multipliers on the side of the slot are awarded for every single row that gets filled up and with the special modifiers that can be activated these values can be raised up to a whopping 30x multiplier by the end of the bonus round. The extra features which are randomly awarded from the right side of the slot when the rows are filled are as follow. Block Destroyer – destroys a multiplier block allowing other multiplier blocks to cascade down increasing in value. Symbol Upgrade – upgrades one of the winning clusters on the grid to the next best paying symbol. 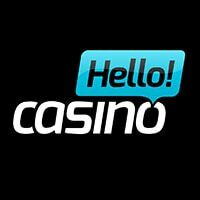 Extra Free Spins – Awards 1 additional Free Spin. The noteworthy point here is that if you manage to trigger the Super Bonus Round these effects are boosted with 3 free spins, 3 blocks destroyed and all winning symbol upgrades. Firstly let’s just get it out the way and say we really enjoyed playing Contact and we definitely suggest you check it out whether that be for real or play money, we enjoyed it so much that we continued playing well after we had tested the slot thoroughly. 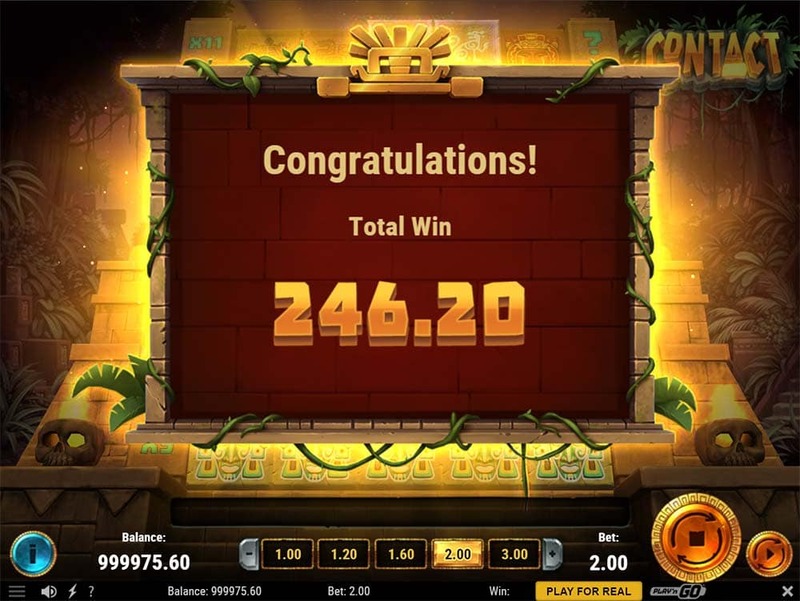 The key features which really make this slot shine are the tumbling reels and anticipation of more wins to reach the bonus triggers at the top, add to that the Super Bonus Round where all the features are boosted further and you have a very exciting and potentially rewarding bonus feature. In our playtests, we managed several Super Bonus Rounds which gave wins well in excess of 100x stake, and with the 30x multiplier on offer the highest win claimed is 1517.5x Total Bet. You are going to get periods of dead spins in the base game, and you could get a complete blank in either of the bonus rounds too, but rack up some early wins in the bonus rounds and this slot becomes very exciting quickly as the multipliers grow and the symbols upgrade! 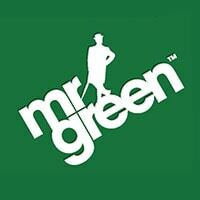 Go check it out and see if you agree with us!